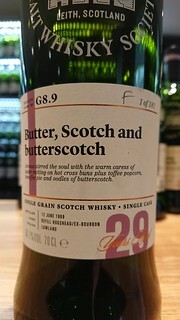 The nose has an initial hint of blackcurrant that quickly burns off and leaves butterscotch, vanilla sponge cake, lavender, toffee pennies and a little fudge. The mouthfeel is thin with a little cling. The body has crystallised ginger, maple syrup, toffee, fudge, lavender, butterscotch and vanilla. The finish has butterscotch, vanilla and crystallised ginger. Water brings out thin, spindly whorling that settles but doesn’t mottle, it just fades away. The nose gains blackcurrant and maple syrup, but loses nothing. The body gains blackcurrant, hints of rosewater and the lavender is quieter. The finish is unchanged. One for summer afternoons in the garden.